The method used for canning a product is determined primarily by the acidity of the food or mixture of foods being canned. Low-acid foods must be processed in a pressure canner to be free of botulism risks. Pressure does not destroy microorganisms, but high temperatures applied for an adequate period of time do kill microorganisms. Successfully destroying all microorganisms capable of growing in canned food is based on the temperature obtained in pure steam, free of air, at sea level. At sea level, a canner operated at a gauge pressure of 10 pounds provides an internal temperature of 240 degrees Fahrenheit. All fresh vegetables except for most tomatoes are low-acid foods. Most mixtures of low-acid and acidic foods also are low-acid products unless their recipes include enough lemon juice, citric acid or vinegar to make them acidic foods. Other low-acid foods are red meats, seafood, poultry and milk. Use Mason-type canning jars no larger than what is recommended for the specific food being canned. Use two-piece, self-sealing lids. Buy only the quantity of lids that will be used in a year and follow the manufacturer’s directions for preparing the lids. After filling jars with food, release air bubbles by inserting a flat plastic (not metal) spatula between the food and the inside surface of the jar. Slowly turn the jar and move the spatula up and down to allow air bubbles to escape. Salt may be added if desired. In vegetables, salt seasons the food but is not necessary to ensure their safety. Add salt substitutes, if desired, when serving. Adjust the head space and then clean the jar rim (sealing surface) with a dampened paper towel. Place the lid, gasket down, onto the cleaned jar-sealing surface. Uncleaned jar-sealing surfaces may cause seal failures. Next fit the metal screw band over the flat lid. To obtain a proper seal, closely follow the manufacturer’s guidelines enclosed with or on the box for tightening the jar lids properly. 1. Internal canner temperatures are lower at higher altitudes. To correct this error, canners must be operated at the increased pressures specified in this publication for appropriate altitude ranges. 2. Air trapped in a canner lowers the temperature obtained at 5, 10 or 15 pounds of pressure and results in underprocessing. 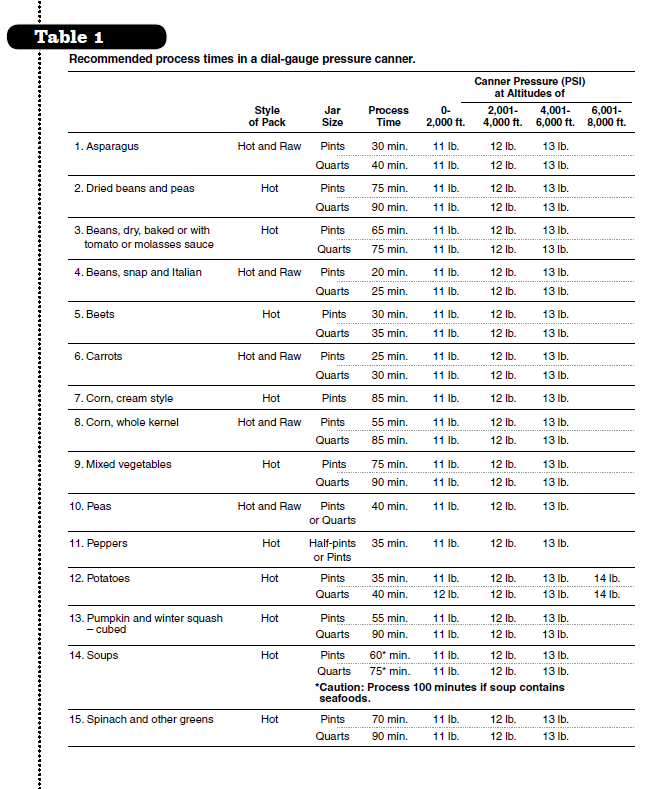 The highest volume of air trapped in a canner occurs in processing raw-packed foods in dial-gauge canners. These canners do not vent air during processing. To be safe, all types of pressure canners must be vented 10 minutes before they are pressurized. Weighted-gauge models exhaust tiny amounts of air and steam each time their gauge rocks or jiggles during processing. They control pressure precisely and neither need watching during processing nor checking for accuracy. The sound of the weight rocking or jiggling indicates that the canner is maintaining the recommended pressure. The single disadvantage of weighted-gauge canners is that they cannot correct precisely for higher altitudes. At altitudes above 1,000 feet, they must be operated at canner pressures of 10 instead of 5 or 15 instead of 10 pounds per square inch (PSI). Check dial gauges for accuracy before use each year and replace the gauges if they read high or low by more than 2 pounds at 5, 10 or 15 pounds of pressure. Low readings cause overprocessing and may indicate that the accuracy of the gauge is unpredictable. Gauges may be checked at most county offices of the NDSU Extension Service and the SDSU Extension Service. Handle canner lid gaskets carefully and clean them according to the manufacturer’s directions. Nicked or dried gaskets will allow steam leaks during pressurization of canners. Keep gaskets clean between uses. Gaskets on older model canners may require a light coat of vegetable oil once per year. Gaskets on newer model canners are pre-lubricated and do not benefit from oiling. Check your canner’s instructions if you doubt that the particular gasket you use has been pre-lubricated. Replacement gauges and other parts for canners often are available at stores offering canning equipment or from canner manufacturers. When ordering parts, give your canner model number and describe the parts needed. 3. Maintain the high heat setting, exhaust steam 10 minutes and then place weight on the vent port or close the petcock. The canner will pressurize during the next three to five minutes. 4. Start timing the process when the pressure reading on the dial gauge indicates that the recommended pressure has been reached or when the weighted gauge begins to jiggle or rock. 5. Regulate the heat under the canner to maintain a steady pressure at or slightly above the correct gauge pressure. 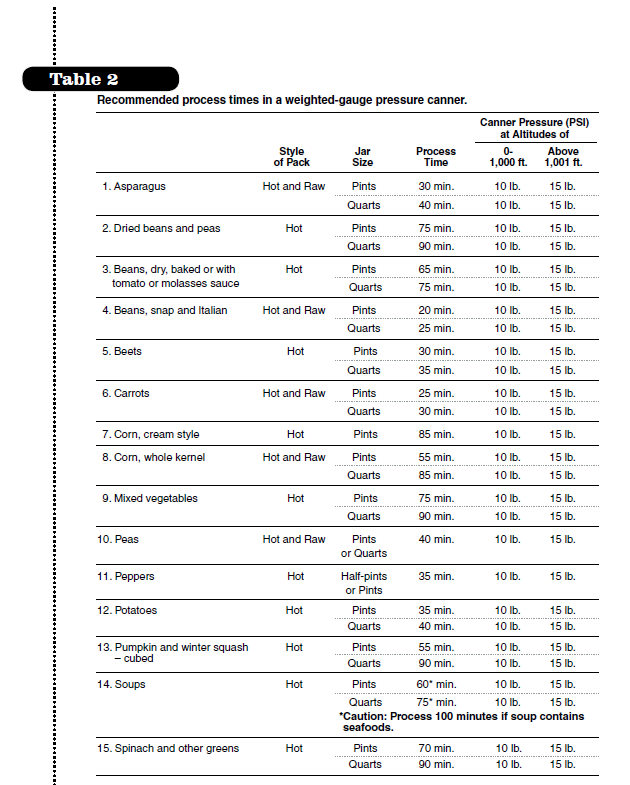 Quick and large pressure variations during processing may cause unnecessary liquid losses from the jars. Weighted gauges on Mirro canners should jiggle about two or three times per minute. On Presto canners, they should rock slowly throughout the process. 6. When the timed process is completed, turn off the heat, remove the canner from the heat if possible and let the canner depressurize. Do not force-cool the canner. Forced cooling may result in food spoilage. Cooling the canner with cold running water or opening the vent port before the canner is fully depressurized will cause loss of liquid from the jars and seal failures. Force-cooling also may warp the canner lid of older model canners, causing steam leaks. Depressurization of older models should be timed. Standard-sized heavy-walled canners require about 30 minutes when loaded with pints and 45 minutes with quarts. Newer thin-walled canners cool more rapidly and are equipped with vent locks. These canners are depressurized when their vent lock piston drops to a normal position. 8. Remove the jars with a lifter and place them on a towel or cooling rack. Do not retighten lids after processing jars. Cool the jars at room temperature for 12 to 24 hours. Jars cooled on racks or towels minimize heat damage to counters. The food level and liquid volume of raw-packed jars will be noticeably lower after cooling. Air is exhausted during processing and food shrinks. If a jar loses excessive liquid during processing, do not open it to add more liquid. Check for sealed lids as described below. Option 2: Tap the lid with the bottom of a teaspoon. If it makes a dull sound, the lid is not sealed. If food is in contact with the underside of the lid, it also will cause a dull sound. If the jar is sealed correctly, it will make a ringing, high-pitched sound. Option 3: Hold the jar at eye level and look across the lid. The lid should be concave (curved down slightly in the center). If the center of the lid either is flat or bulging, it may not be sealed. If a lid fails to seal on a jar, remove the lid and check the jar-sealing surface for tiny nicks. If necessary, change the jar; add a new, properly prepared lid and reprocess within 24 hours using the same processing time. Head space in unsealed jars may be adjusted to 1½ inches and jars could be frozen instead of reprocessed. Foods in single unsealed jars could be stored in the refrigerator and consumed within several days. Hot pack — Cover asparagus with boiling water. Boil two or three minutes. Loosely fill jars with hot asparagus, leaving 1 inch of head space. Raw pack — Fill jars with raw asparagus, packing as tightly as possible without crushing, leaving 1inch of head space. Add 1 teaspoon of salt per quart to the jars, if desired. Add boiling water, leaving 1 inch of head space. Adjust lids and process according to No. 1 on Table 1 or 2. Procedure: Place dried beans or peas in a large pot and cover with water. Soak 12 to 18 hours in a cool place. Drain water. To quickly hydrate beans, you may cover sorted and washed beans with boiling water in a saucepan. Boil two minutes, remove from heat, soak one hour and drain. Cover beans soaked by either method with fresh water and boil 30 minutes. Add ½ teaspoon of salt per pint or 1 teaspoon per quart to the jar, if desired. Fill jars with beans or peas and cooking water, leaving 1 inch of head space. Adjust the lids and process according to No. 2 on Table 1 or 2. Procedure: Soak and boil beans and prepare molasses sauce according to directions for beans with sauce that follows. Place seven ¾-inch pieces of pork, ham or bacon in an earthenware crock, a large casserole or a pan. Add beans and enough molasses sauce to cover the beans. Cover and bake four to five hours at 350 F. Add water as needed, which is about every hour. Fill jars, leaving 1 inch of head space. Adjust the lids and process according to No. 3 on Table 1. Tomato Sauce — Option 1: Mix 1 quart of tomato juice, 3 tablespoons of sugar, 2 teaspoons of salt, 1 tablespoon of chopped onion and ¼ teaspoon each of ground cloves, allspice, mace and cayenne pepper. Heat to boiling. Option 2: Mix 1 cup of tomato ketchup with 3 cups of cooking liquid from the beans. Heat the sauce to boiling. Molasses Sauce — Mix 4 cups of water or cooking liquid from the beans, 3 tablespoons of dark molasses, 1 tablespoon of vinegar, 2 teaspoons of salt and ¾ teaspoon of powdered dry mustard. Heat to boiling. Fill jars three-fourths full with hot beans. Add a ¾-inch cube of pork, ham or bacon to each jar, if desired. Fill jars with heated sauce, leaving 1 inch of head space. Adjust the lids and process according to No. 3 on Table 1 or 2. Hot pack — Cover with boiling water; boil five minutes. Fill jars loosely, leaving 1 inch of head space. Raw pack — Fill jars tightly with raw beans, leaving 1 inch of head space. Add 1 teaspoon of salt per quart to the jar, if desired. Add boiling water, leaving 1 inch of head space. Adjust the lids and process according to No. 4 on Table 1 or 2. Procedure: Trim off beet tops, leaving an inch of stem and roots to reduce bleeding of color. Scrub well. Cover with boiling water. Boil until skins slip off easily, about 15 to 25 minutes depending on size. Cool, remove the skins and trim off stems and roots. Leave baby beets whole. Cut medium or large beets into ½-inch cubes or slices. Halve or quarter very large slices. Add 1 teaspoon of salt per quart to the jar, if desired. Fill jars with hot beets and fresh hot water, leaving 1 inch of head space. Adjust the lids and process according to No. 5 on Table 1 or 2. Quality: Select small carrots, preferably 1 to 1¼ inches in diameter. Larger carrots often are too fibrous. Procedure: Wash, peel and rewash carrots. Slice or dice. Hot pack — Cover with boiling water; bring to a boil and simmer for five minutes. Fill jars, leaving 1 inch of head space. 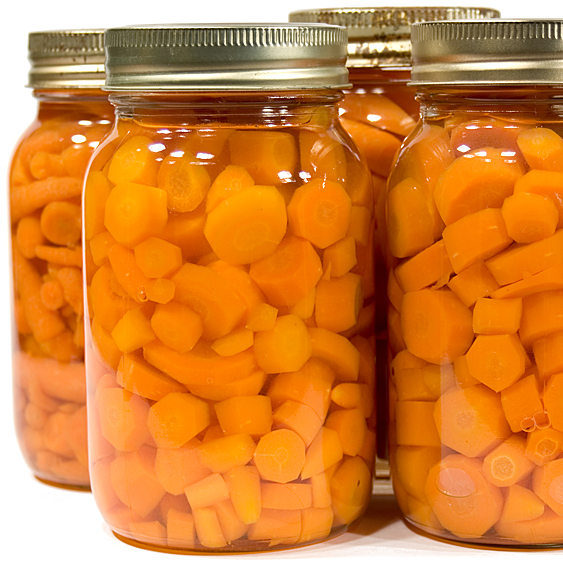 Raw pack — Fill jars tightly with raw carrots, leaving 1 inch of head space. Add 1 teaspoon of salt per quart to the jar, if desired. Add hot cooking liquid or water, leaving 1 inch of head space. Adjust the lids and process according to No. 6 on Table 1 or 2. Quality: Select ears containing slightly immature kernels or kernels of ideal quality for eating fresh. Procedure: Husk corn, remove silk and wash ears. Blanch ears four minutes in boiling water. Cut corn from cob at about the center of kernel. Scrape remaining corn from cobs with a table knife. Hot pack — To each quart of corn and scrapings, add 2 cups of boiling water. Heat to boiling. Add ½ teaspoon of salt to each jar, if desired. Fill pint jar with hot corn mixture, leaving 1 inch of head space. Adjust lids and process according to No. 7 on Table 1 or 2. Quality: Select ears containing slightly immature kernels or kernels of ideal quality for eating fresh. Canning of some sweeter varieties or too immature kernels may cause browning. Can a small amount; check the color and flavor before canning large quantities. Procedure: Husk the corn, remove the silk and wash. Blanch three minutes in boiling water. Cut corn from the cob at about three-fourths the depth of the kernel. Caution: Do not scrape the cob. Scraping the cob would make this product too dense to process at the times given. Hot pack — To each quart of kernels in a saucepan, add 1 cup of hot water, heat to boiling and simmer five minutes. Add 1 teaspoon of salt per quart to the jar, if desired. Fill jars with corn and cooking liquid, leaving 1 inch of head space. Raw pack — Fill jars with raw kernels, leaving 1 inch of head space. Do not shake or press down. Add 1 teaspoon of salt per quart to the jar, if desired. Add fresh boiling water, leaving 1 inch of head space. Adjust the lids and process according to No. 8 on Table 1 or 2. Procedure: Except for zucchini, wash and prepare vegetables as described for each vegetable. Wash, trim and slice or cube zucchini; combine all vegetables in a large pot or kettle and add enough water to cover the pieces. Add 1 teaspoon of salt per quart to the jar, if desired. Boil five minutes and fill jars with hot pieces and liquid, leaving 1 inch of head space. Adjust the lids and process according to No. 9 on Table 1 or 2. We recommend that sugar snap and Chinese edible pods be frozen for best quality. Hot pack — Cover with boiling water. Bring to a boil in a saucepan and boil two minutes. Fill jars loosely with hot peas and add cooking liquid, leaving 1 of inch head space. Raw Pack — Fill jars with raw peas and add boiling water, leaving 1 inch of head space. Do not shake or press down peas. Adjust the lids and process according to No. 10 on Table 1 or 2. Oven or broiler method: Place peppers in a hot oven (400 F) or broiler for six to eight minutes until skins blister. Range-top method: Cover a hot burner, either gas or electric, with heavy wire mesh. Place peppers on the burner for several minutes until skins blister. Allow peppers to cool. Place them in a pan and cover them with a damp cloth. This will make peeling the peppers easier. After several minutes, peel each pepper. Flatten whole peppers. Add ½ teaspoon of salt to each pint jar, if desired. Fill jars loosely with peppers and add fresh boiled water, leaving 1 inch of head space. Adjust the lids and process according to No. 11 on Table 1 or 2. An average of 20 pounds is needed per canner load of 7 quarts; an average of 13 pounds is needed per canner load of 9 pints. Quality: Select small to medium-size mature potatoes of ideal quality for cooking. Tubers stored below 45 F may discolor when canned. Choose potatoes 1 to 2 inches in diameter if they are to be packed whole. Quality: Pumpkins and squash should have a hard rind and stringless, mature pulp of ideal quality for cooking fresh. Small-sized pumpkins (sugar or pie varieties) make better products. Procedure: Wash, remove the seeds, cut into 1-inch-wide slices and peel. Cut flesh into 1-inch cubes. Boil two minutes in water. Caution: Do not mash or puree. Fill jars with the cubes and cooking liquid, leaving 1 inch of head space. Adjust the lids and process according to No. 12 on Table 1 or 2. For making pies, drain jars and strain or sieve the cubes. Procedure: Select, wash and prepare vegetables, meat and seafoods as described for the specific foods. Cover meat with water and cook until tender. Cool the meat and remove the bones. Cook vegetables. For each cup of dried beans or peas, add 3 cups of water, boil two minutes, remove from the heat, soak one hour and heat to boiling. Drain and combine with meat broth, tomatoes or water to cover. Boil five minutes. Caution: Do not thicken before canning. Salt to taste, if desired. Fill jars halfway with solid mixture. Add remaining liquid, leaving 1 inch of head space. Adjust lids and process according to No. 13 on Table 1 or 2. Process 100 minutes if the soup contains seafood. Do not add noodles or other pasta, rice, flour, cream, milk or other thickening agents to home-canned soups. If dried beans or peas are used, they must be fully rehydrated first. Quality: Can only freshly harvested greens. Discard any wilted, discolored, diseased or insect-damaged leaves. Leaves should be tender and attractive in color. Procedure: Wash only small amounts of greens at one time. Drain the water and continue rinsing until the water is clear and free of grit. Cut out tough stems and midribs. Place 1 pound of greens at a time in a cheesecloth bag or blancher basket and steam three to five minutes or until well wilted. Add ½ teaspoon of salt to each quart jar, if desired. Fill jars loosely with greens and add fresh boiling water, leaving 1 inch of head space. Adjust the lids and process according to No. 14 on Table 1 or 2. The altitude in South Dakota varies from 1,200 feet to 6,000 feet above sea level. 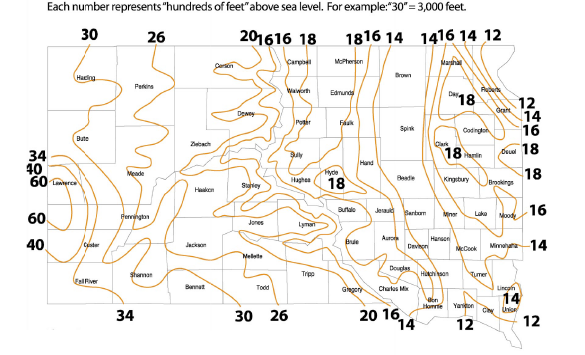 The map below shows the approximate altitude of areas in South Dakota. For more information on this and other topics, see this site. Source: Based on “Complete Guide to Home Canning,” Agriculture Information Bulletin 539, 2009 revision, and information from the National Center for Home Food Preservation, University of Georgia, Athens, Ga.